Now, I want to share my opinion regarding some information leaked about the new 40k supplement, "death from skies" dedicated to flyers. For those of you that don’t know yet, get here and check the rumors. And yes, they are rumors, but usually natfka is right, especially when so close to the release date (two weeks from now), so I will give my opinion about these rumors. First, about the changes that it brings to the game, and then about the ssupplement itself. It says that you can use now the Stormraven with the Vanilla space marines and the Back Templars. I am ok with the Vanilla Space Marines having it, I think that they are the core of the Space Marines, so they should have available everything except what defines the core of the non-vanilla space marines. I mean, for me (as a player both of Space Marines and Space Wolves) it doesn't make any sense having thunderwolfs available for Ultramarines: they are originally from Fenris, and they match the character of the space wolves perfectly. 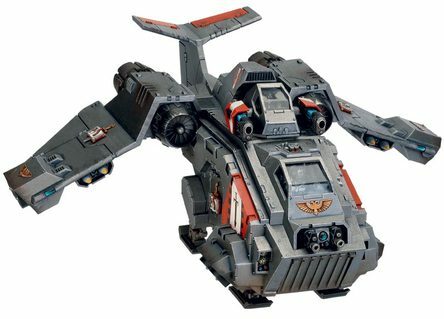 A vehicle is something that is much more generic, and if one space marine army can use it, it makes sense some other can use it, unless it's something very specific. So ok with the Space Marines. And I agree that the Black Templars should a flyer; they have been left aside on the last years, so it's not bad to give them some push; I think they are a cool army. The fair thing is that every army should have a flyer. (I am considering that the rumors that say that we will get Eldar, Tau, Tyranid, and Dark Eldar flyers with the next White Dwarf are real). Once we have those released, the only armies without a flyer would be the Space Wolves, and the Sisters of Battle. And that I just don't understand. I am very much of the opinion that the armies must be different from each other; we just don't want some minis doing exactly the same in every army. Some flyers are better against other flyers and some are better against tanks, infantry, etc. But the same as every army has tanks, and some kind of bikers, it makes sense as well having flyers, even if their porpoises are very specific (like there are bikes that are good for assault and others that are better at shooting). I have heard that Russ intended us to fight with both feet firmly planted on the ground, and I agree with that: Space Wolves is an assault army, and it is part of their nature the intention of assaulting the enemy as soon as possible. So, what can be better for that than a flyer that transport your troops so you can assault? Also, in the books, Space Wolves love the Thunderhawkes: they are fast, noisy (so they can make their enemy know that they are coming and scare the s***t out of them; Wolves are not subtle), and they love feeling the air in their faces. So, why not? The same for Sisters of Battle, they should be able to use a flyer as well. And considering they have some tanks of their own, why not a flyer? I remember reading in an interview with one of the guys of the studio that they were leaving the sisters of battle a bit aside by now, but unless they plan to do that quickly, it's not going to work. About what they bring to the game with this supplement: more units, and more waits to play, which is always good! I like the dog fighting rules presented it "crusade of fire", and makes sense updating the rules of the current flyers (if that's what it is going to do). So, conclusion: flyers for everyone, now! (And I don't count the FW models: not everyone can expend 120 euros in a StormEagle or a Caestus Assault Ram just to use in a couple of games). And to me, the "English only" doesn't make a lot of sense, but who knows...FW are only in English. So, I will have a look at this supplement, but unless it brings something more than what the rumors are saying, I won't buy it.